These precision-calibrated, adjustable, slotted plug flow regulating valves (hand expansion valves) are ideal for metering or flashing expansion of liquid refrigerants. Their slotted plugs are more tolerant of dirt particles than are common metal-seated taperedplug expansion valves, and are less susceptible to wire drawing. 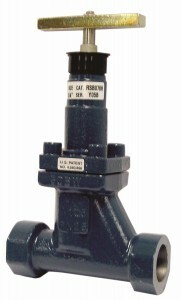 Valves 2½” (65 mm) and larger have a characterized plug. All valves have near linear flow characteristics per turn open and are tight closing with Teflon seats. These valves have stainless steel stems with back seating for seal replacement. The patented non-leak seal plus packing design permits low torque operation for valve adjustments since the packing nut requires little tightening. Bar handle or yellow seal caps distinguish them from shut-off valves. Suitable for ammonia or halocarbons.